Suddenly Bali. I was unpacking my luggage post-Christmas holiday in Japan when Mumun from iwashere.id called me, "Hey, Debz! Would you like to join a retreat in Bali next week?". Of course I said yes because the best thing to cure post holiday blues is by going to another holiday, right? 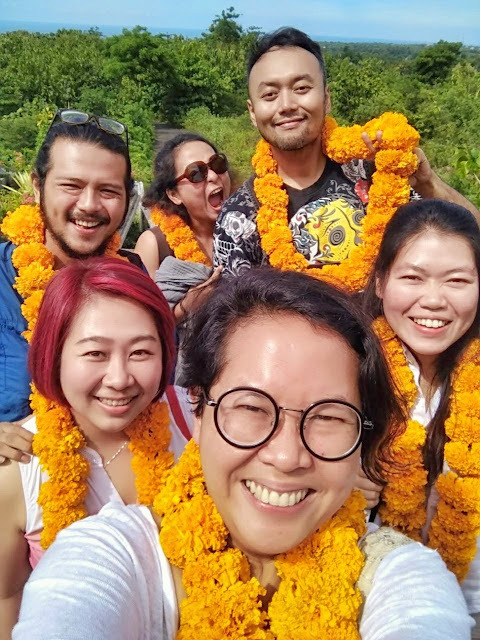 I was invited along with Trinity, Vabyo, Adit and Ramon; and Prasana by Arjani Resorts would be our home for the 3 days #IWHcreator retreat. 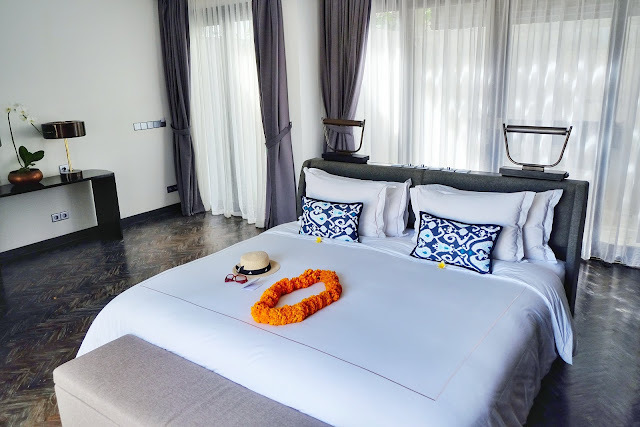 I stayed in a one bedroom villa with swimming pool, lounge area, kitchenette and outdoor day bed. This area is private with a total space around 145 sqm. It's pretty huge considering I was staying there alone. I could do my silly dance and jumping around the villa without annoying other people *big grin*. I'm a light sleeper. Occasionally it's hard for me to get a quality night sleep because even the slightest sound of an ant walking would wake me up. Thanks to the top quality double mattress king bed and tranquil environment, I slept soundly I might even snored and recharged well. My room looked this neat all the time because Prasana has twice-a-day housekeeping service for all the villas. I was so spoilt I can never tidy up my own bed again at home, lol. Unless your skin is super sensitive like mine that need some particular skincare products, I don't think you would need to bring your basic amenities like shampoo, conditioner, body wash and etc. Prasana provides most essential stuff including salt bath, sunblock and after sun cooling gel. How thoughtful! My most favourite service is definitely the all day breakfast. I usually skip breakfast during hotel stays because mostly serve breakfast only until 10 am. For me, sometimes holiday means all day snuggle mood thus a hotel which has an all day breakfast service is truly a God send. 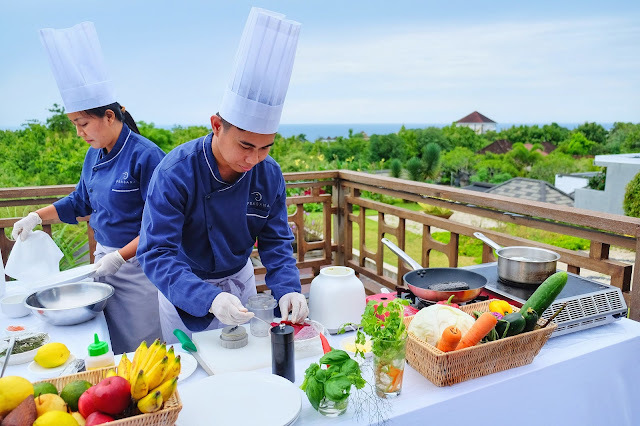 In-house guest in Prasana can choose to have their breakfast in their villa or restaurant. Breakfast in bed in late afternoon? Yes, please! It was drizzling in the morning so I needed a stronger will to wake up and leave my super comfy bed. But beach hopping was on our agenda, so I jumped out my bed with excitement, had a quick shower and off to the beach. 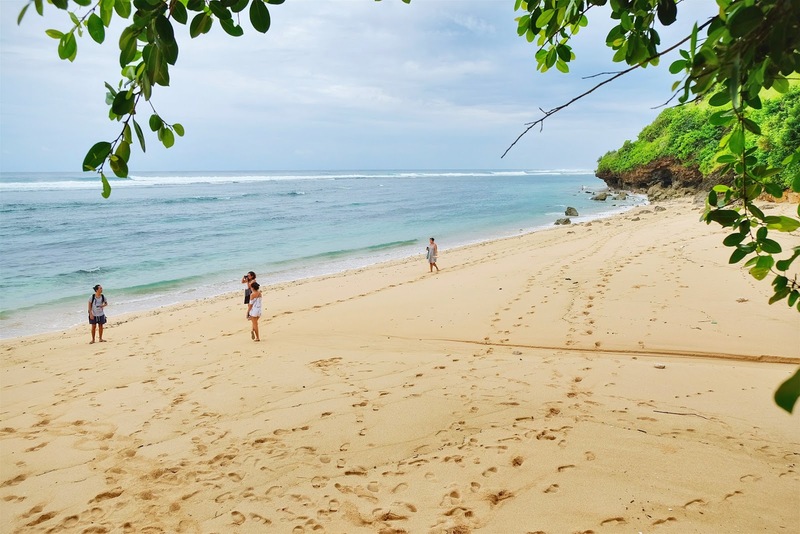 We were thrilled to see an empty secluded and clean beach. Some of us jumped into the water straight away. 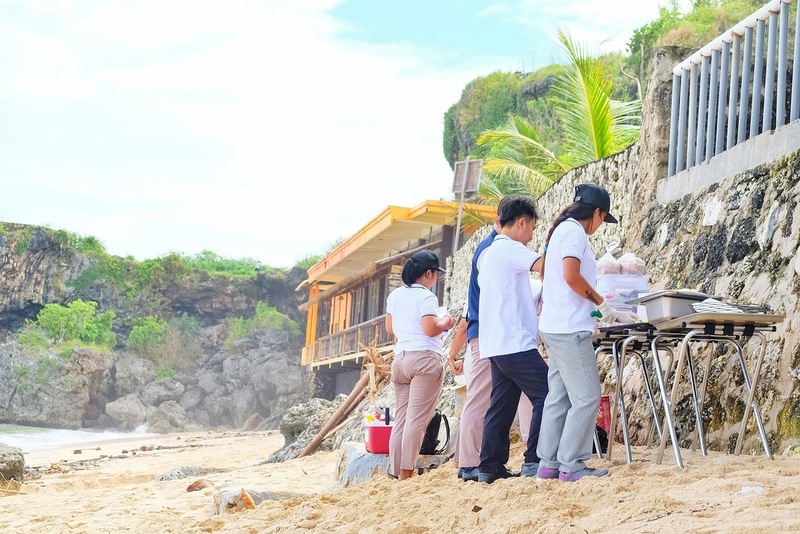 We then headed to Balangan beach where Prasana team were already preparing a picnic breakfast for us. They served what it seems like never ending food. 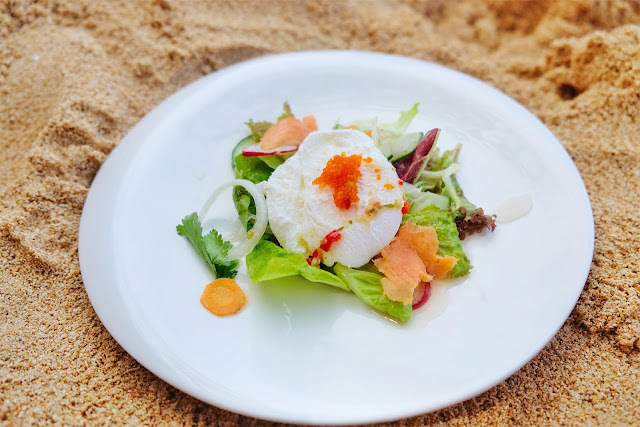 From assorted fresh fruit juice, fruit platter, granola yogurt bowl, pastries basket (croissant, pain au chocolate and danish), a plate of poached egg with salad and salmon, stacks of sandwiches and whole fresh coconuts. The food were aesthetically attractive, I really think it's the most beautiful picnic breakfast I've ever had! Well it's not everyday I have a picnic with all those shiny cutleries and fancy plates. After a hearty breakfast to kick start the day, I rushed back to the villa and ready for my spa session. Ohhh bliss! In the afternoon we visited Brew Me tea gallery in Blahbatu area. Learning some new things about tea production from A to Z in fun a way. 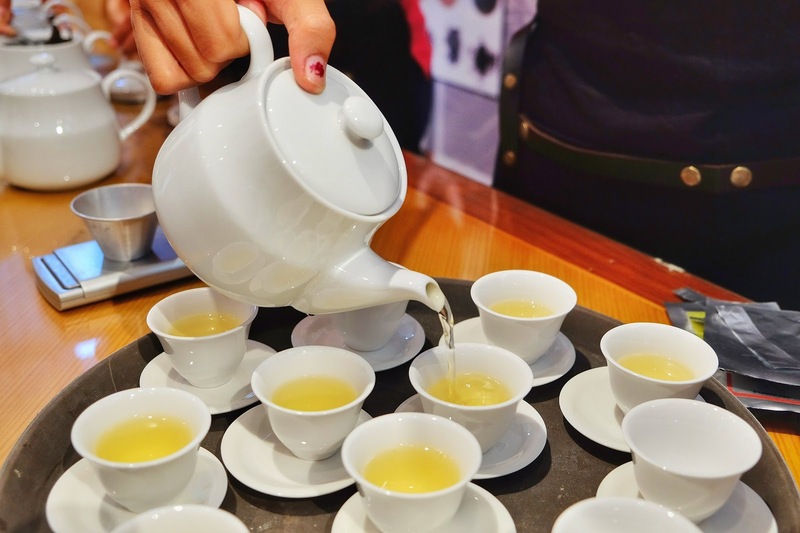 The tea tasting session taught me how to tell different tastes among white tea, green tea, oolong tea and black tea. Brew Me tea premium quality tea are carefully hand picked from their own plantation and processed in their factory in Tabanan area. Cooking class was so much fun too! 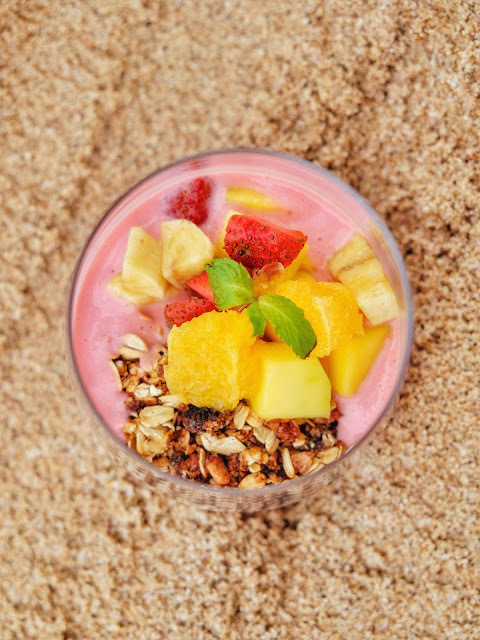 Chef Toni showed us how to cook an easy yet healthy breakfast. He started off with smearing some butter on a charcoal bread and toast it on a non-stick pan. While chef Endang was poaching some eggs. They then prepared sabayon sauce by whisked some egg yolk with sugar and lemon juice over bain marie to get a thick consistency before adding a spoonful of beetroot puree. Last but not least, chef Toni started to plate all the items and voila! 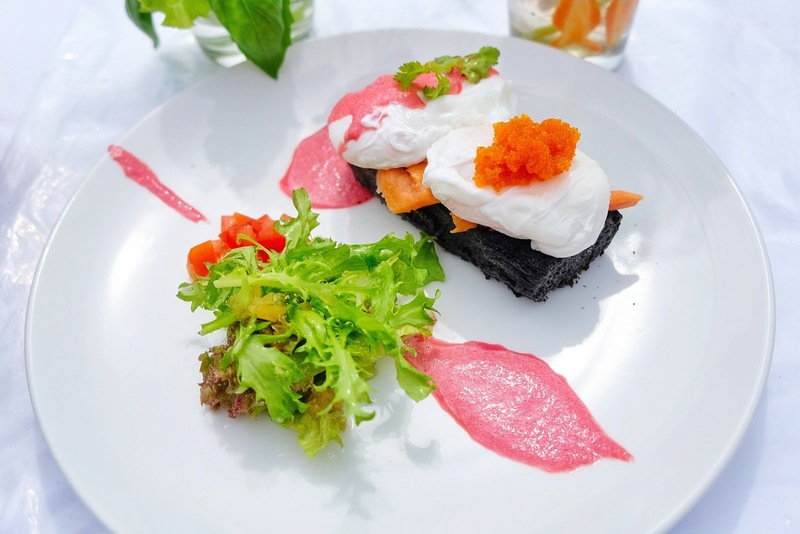 Charcoal toast, salmon slices, poached egg topped with tobiko or flying fish roe served with salad with honey lemon dressing and beetroot sabayon sauce. During the welcome dinner, we were accompanied by Ibu Mia, the General Manager and Bapak Andika, Owning Company Representative of Prasana. The first dish they served was Medallion Chicken Salad. 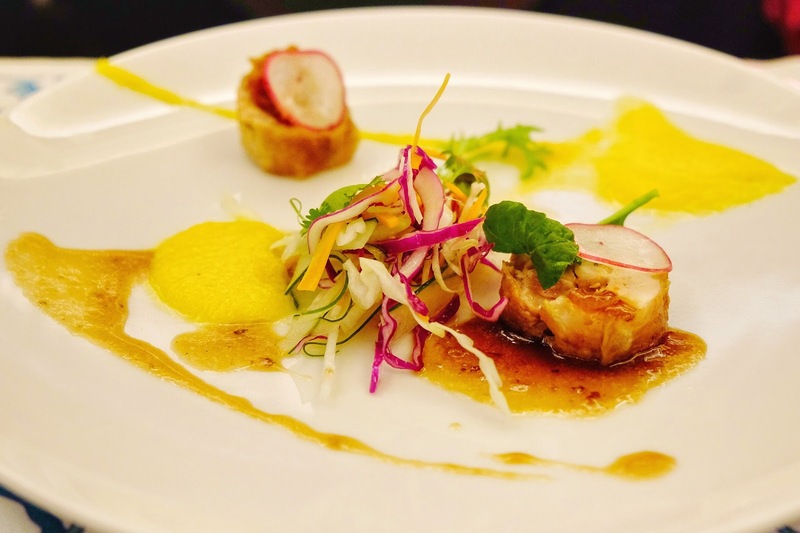 Beautiful plate presentation with colourful Asian slaw as a garnish. Manadonese sambal rica was a perfect match for the well marinated and tender chicken. I also love the adding of lemon confit as it refreshed my palate. Next came Seafood Consome served in a wide rim soup bowl. I studied European Culinary Arts before and one thing I remember is aside from taste, we eat food visually. 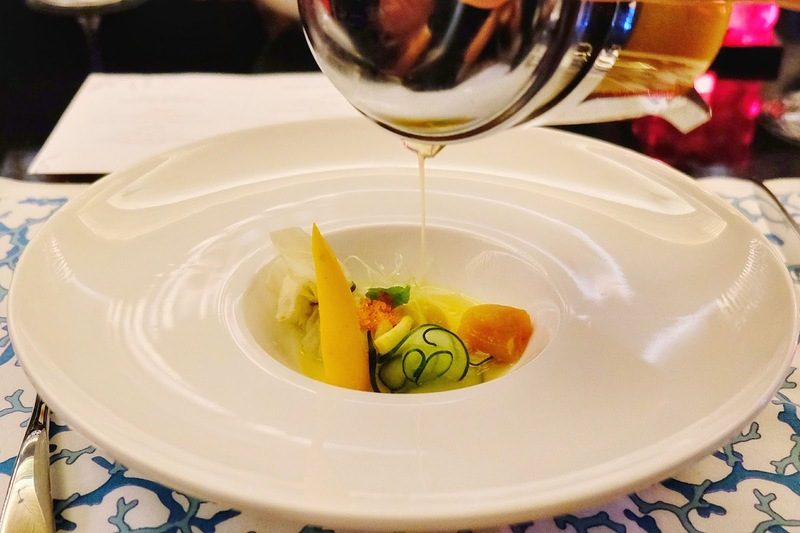 And this bowl of seafood dumpling with vegetables was certainly presented to please the eyes. While bouillon or the rich clear seafood stock merged beautifully with coconut milk. A flavourful dish indeed. Main course consisted of 5 items: Glazed Miso Chicken, Beef Rendang, Veggie Stew on Mashed Potato, Coconut Rice and for me the star was this Crusted Fillet Fish. I'm not too sure if it was dory fish but the white flesh was firm and has this flaky texture. The skin was covered in flavourful spice tempe crumbs which added the extra oomph. 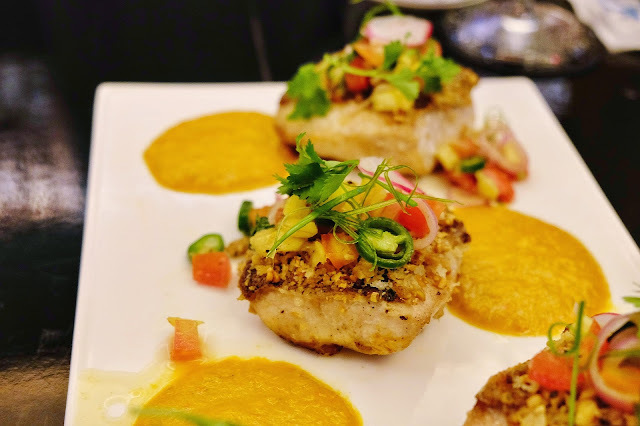 Woku sauce and pineapple tomato salsa were on point too, with just the right amount of rich aroma, tanginess and spicy taste without overpowering the fish. 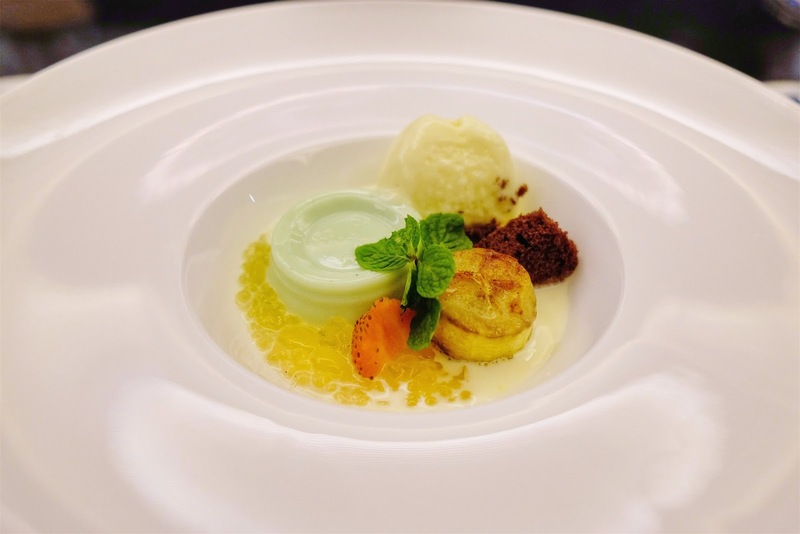 This one is the interesting version of Indonesian sweet dessert named Kolak. It contained of Pandan panna cotta, caramelised banana, sago milk, palm sugar crumb and homemade vanilla ice cream drenched in rich coconut milk. I love how each of the elements complement each other and it's not too sweet like the Kolak I usually eat back home. 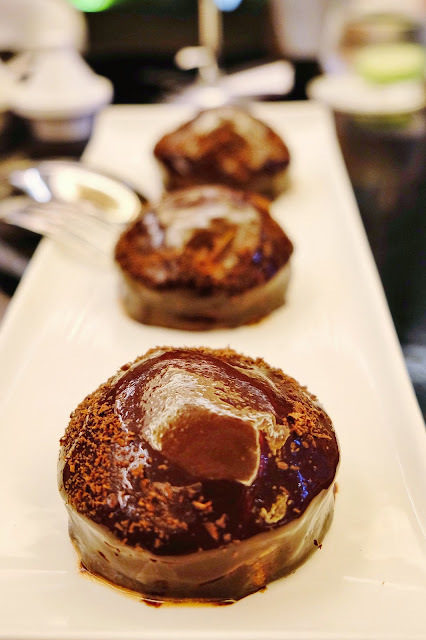 I was already stuffed after 2 starters, 5 items of main course and the Kolak but when they serve this Choco Mousse Pie, I just couldn't refuse it. Just one bite, I kept saying that to myself. But as soon as the banana mousse and dark chocolate glaze melting in my mouth, I knew I would have a hard time to put my spoon down. The combination of smooth filling with crunchiness from the almond crust was so addictive. It's simply sinful yet unrefusable. Suddenly everyone on the table were quiet, only a delightful 'mmmm' could be heard from their mouth. The face said it all....they were having their own version of mind-blowing moment. Though I'm not really into alcoholic beverages, I was curious about this particular cocktail named Blue Sapphire. The 'wow' moment was when the waitress pouring the extract of Bunga Telang Ungu or Butterfly Pea flower into the vodka. 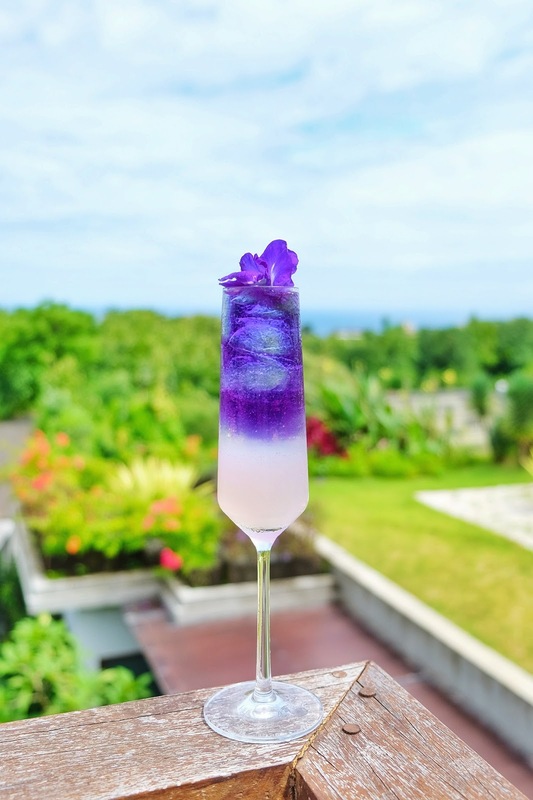 The white and purple liquids gradually blending into a pretty layered drink, garnish with a Butterfly Pea flower on the glass rim. I can't really elaborate the taste since I only took a tiny sip of it. There's no distinct taste from the vodka but I tasted a hint of lemongrass which I think from the flower extract. Thank you IWasHere for inviting me to join the creator retreat together with a bunch of the awesomest folks. 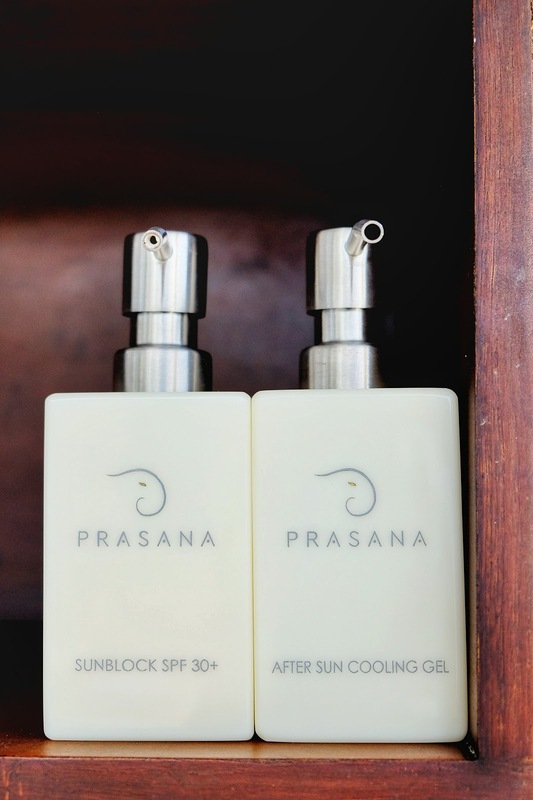 Thanks so much to all Prasana by Arjani Resorts' team for the warmest and sincere hospitality. 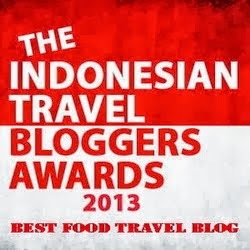 I was invited to specifically review the cuisine, so I'd like to extend my appreciation to Prasana F&B team. I'm not a picky eater, I can eat almost everything. However my taste buds do judge food. While most of the time I enjoy of the food I eat, only a few could really make my taste buds dancing in joy. However I can safely say that the food I've tasted during my 3 days staying in Prasana villa were exceeding my taste buds' expectation. 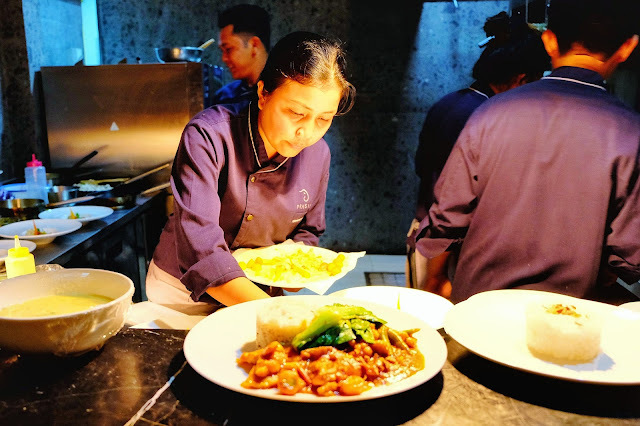 Kudos to Chef Toni and his squad! I would in a heartbeat travelling all the way back to Prasana just to enjoy the food in their beautiful restaurant. * I was invited as a guest. But opinions, happy tummy and the dancing taste buds are all mine. This is what I love the most about Bali. They have such amazing resorts, hotels and home stays, Villas which are so luxurious yet not so expensive. It's one of those few places where 'affordable luxury' is something you can experience in the true sense! 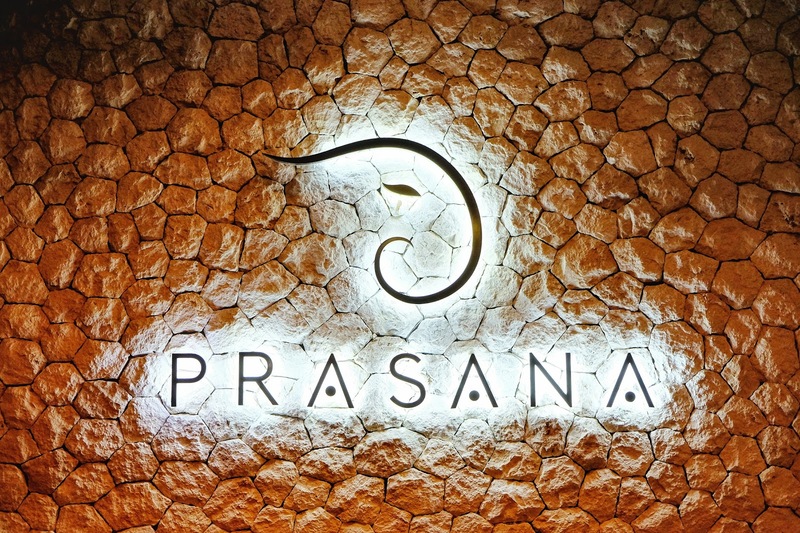 Prasana by Arjani looks gorgeous and I can see that you also made the most of the amazing food there! All day breakfast seems like a great idea, and yes, breakfast in bed is God sent. 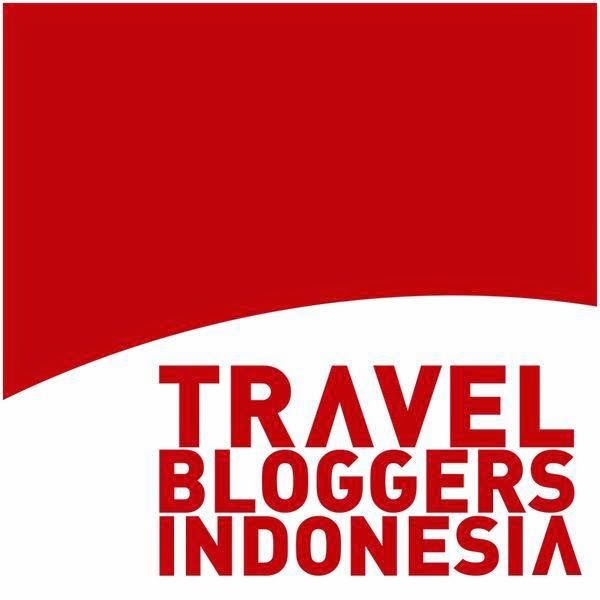 Can I say Hi to Ramon, Mumun and Ramon - we travelled together on one Indonesia trip. Good to see you all. Looks like Prasana team pampered you a lot. Ah it was such a nice time, wasn't it. Oh I didn't know you were a light sleeper. Knowing this, I wouldn't have slept over. I hope you had a good sleep that night, especially remembering that I had to go to the bathroom a few times in the night. Prasana looks like one of those dream resorts. The private access to secluded beach is just awesome. Looks like they have ensured one does not need to step out of the resort. Kolaks , blue sapphires and other delicacies look mouth watering even in the photos :) :) . To top it all have breakfast when you want is a luxury that most hotels don't provide. The villa looks amazing! 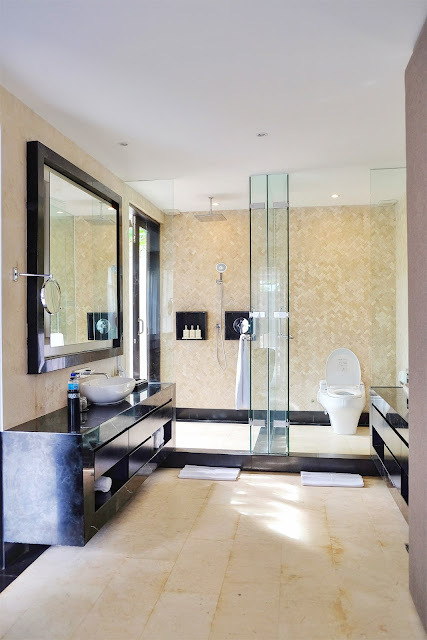 Love the private pool and the large bathroom. 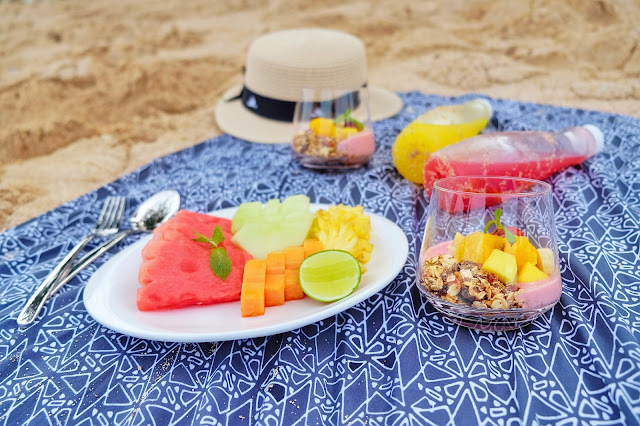 The food looks delicious with beautiful presentation and the blue sapphire cocktail looks too good to drink! The resort is amazing! The food presentation is excellent, I was drooling over the pictures, especially that of blue sapphire cocktail. Was there a temple inside the complex? 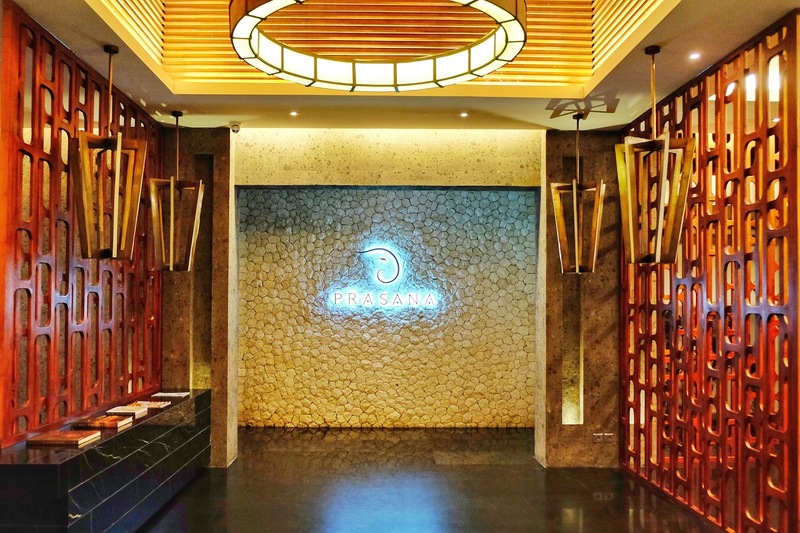 Usually all buildings of Bali has one. This place looks gorgeous! I've never actually gone skinny dipping, and I don't know if I would want to be caught on CCTV. I like the path down to the beach, and breakfast on the sand sounds divine! 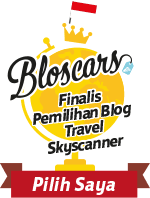 Just another reason to make it to Bali this year. That hotel really sounds classy. I really need to spend some time in hotels instead of just choosing Airbnb’s. Lol. That Coco Mousse Pie looks so delicious and the blues sapphire drink totally looks like jewellery. Awesome. 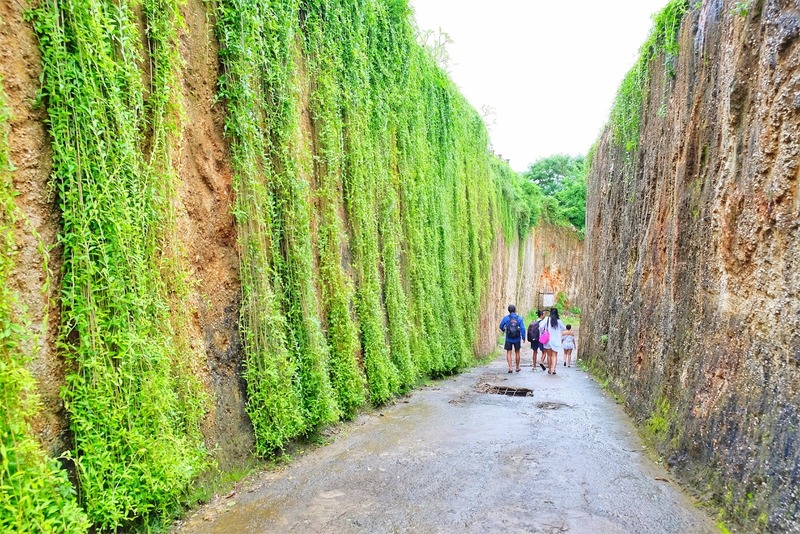 Bali is on my to go to list. Wow, an all day breakfast?! I've never heard of a hotel doing that before so I think that really makes it stand out. I also love the fact that you can have it at your villa. And with all the food looking so good in your photos, I don't think I'd ever want to leave! 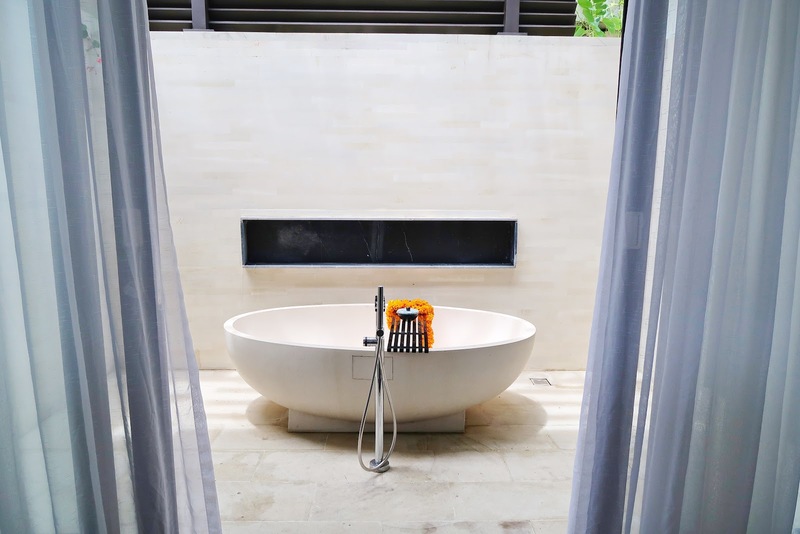 Prasana By Arjani Resorts looks like a wonderful place to stay in Bali – the accommodation is so luxe! 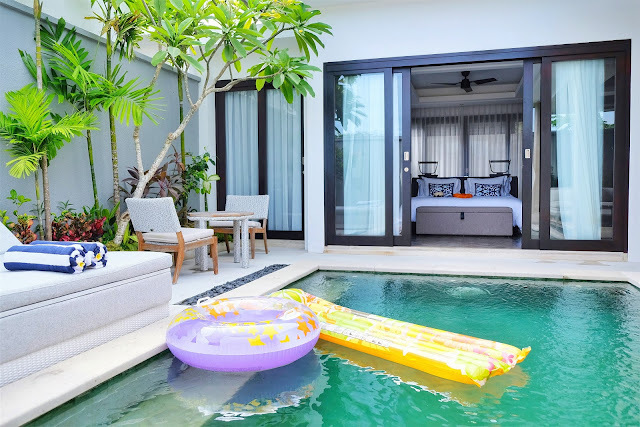 Such a luxury to have a private pool as part of your villa – and good to know that you slept really well – my husband is a light sleeper too, so we usually try to avoid places which are known for a lot of noise. Breakfast on the beach sounds heavenly – we’re in Australia, so quite close to Bali, will have to get there soon!